Sichol & Hicks, P.C. - Suffern, New York Personal Injury, Elder Law and Real Estate Attorneys | Sichol & Hicks, P.C. Leading New York personal injury lawyersIt is the firm’s policy to thoroughly prepare every case for trial, so insurance companies know that these lawyers will not hesitate to try your case. The firm’s record of success at trial is a valuable asset when it comes to settlement negotiations and the firm has a reputation for maximizing the value of every case. They accept injury cases from throughout the region, including Rockland County, Orange County, Putnam County, Greene County, Westchester County, Nassau County, and Suffolk County.Responsive personal serviceIn plaintiffs’ personal injury cases, the firm’s goal is to obtain monetary settlements for lost wages, medical expenses and pain and suffering. In most cases it is possible to obtain a favorable settlement through negotiation. You can count on them to listen carefully and work closely with you to understand every aspect of your case. They return your phone calls. They know how important your case is to you and they keep you apprised of developments as they happen.Reputation for excellenceSichol & Hicks is among a select group of law firms listed in the New York Bar Register of Pre-Eminent Lawyers and is the only firm based in Rockland County rated Pre-Eminent in the field of personal injury. This is a directory of leading law firms that includes only those lawyers and firms that have earned the AV rating from Martindale-Hubbell, the nation’s oldest and most respected attorney rating entity. The “A” rating recognizes the firm’s preeminent legal ability and professionalism. The “V” rating communicates “Very High” ethical standards. Sichol & Hicks is one of fewer than 60 New York firms listed in the area of Medical Malpractice and fewer than 80 firms included in the area of Personal Injury.Free consultation and contingency arrangements. The attorneys of Sichol & Hicks are available to assist you and the members of your family. If you are unable to come to their offices, they will come to your home or hospital room. Of course, there is no fee in personal injury matters unless the firm recovers damages for you. You can reach us at 845-357-4422 or 800-529-4422. 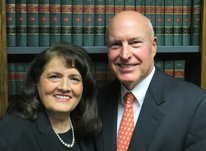 Based in Rockland County, New York, the experienced trial lawyers of Sichol & Hicks have a record of results in complex auto and motorcycle accident cases, work-related accidents, such as construction accidents, scaffold falls, ladder falls and crane accidents, medical malpractice, amputations, negligence, and death cases. Clients of Sichol & Hicks get the benefit of their many years of experience in handling serious matters, such as birth injuries, brain injuries, bone fractures, injuries from defective products, workplace and labor law accidents, medical malpractice, playground accidents, negligent security cases, and more. Additionally, the firm specializes in the fields of Estate Planning, Elder Law, Real Estate and Advocacy for the Developmentally Disabled.